If you're looking for a quiet steamboat spot to hold large gatherings for your friends or family, Hua Ting Steamboat is one option for you to consider. This 1-year old+ restaurant is owned and operated by Orchard Hotel, a subsidiary of the Millennium & Copthorne Hotels Group. Diners can enjoy hassle-free and delicious mini pots made up of scrumptious broths and freshly-picked, quality ingredients, a perfect setting for your convivial reunions. 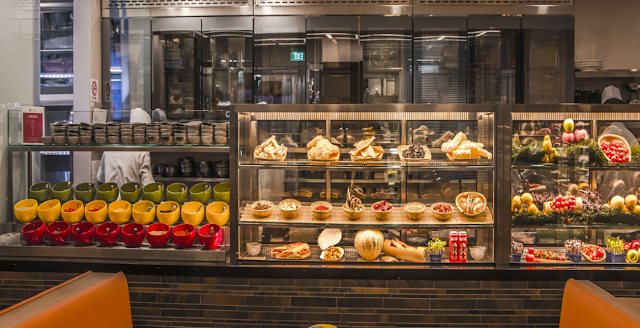 There are three set menus priced from S$68 per person. We went for the a la carte option so as to try a wide variety of items. This is not an invited tasting review. Additional Tips: Mix and match the sauces for a unique twist of flavours. Check out Hua Ting Facebook for periodic offers. 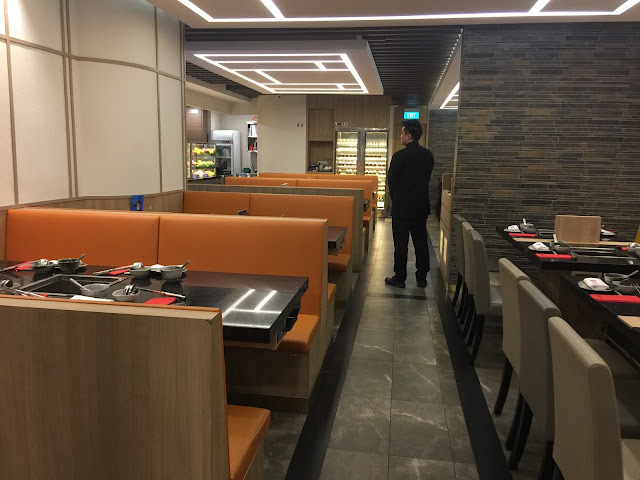 The layout at Hua Ting Steamboat is very well-planned— there are two private rooms which can be combined into a single, large room for corporate, friends or family gatherings. Each room can house about 10 people and there are two steamboats in each room. Each steamboat has a divider that allows for two separate broths. The seats are in bright orange, which psychologically has been hypothesised to make one feel even more hungry. 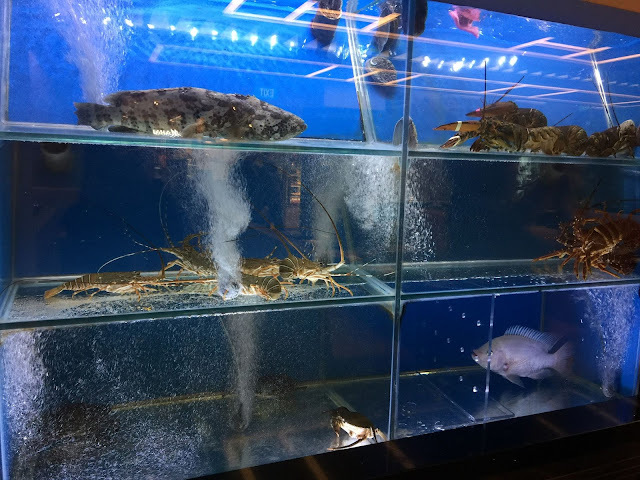 One greatest draw to this place is the glass display of live seafood, dried food and fruits, sauces and condiments. We were served by three separate service staff and they were all very friendly and polite. We had several questions about the menu, and they were all able to quickly answer our questions from memory as well as provide great recommendations for our preferences. Prior to the meal, we were given bibs so as to keep our shirts clean! The staff was also adept in clearing dirty and used plates throughout our meal. 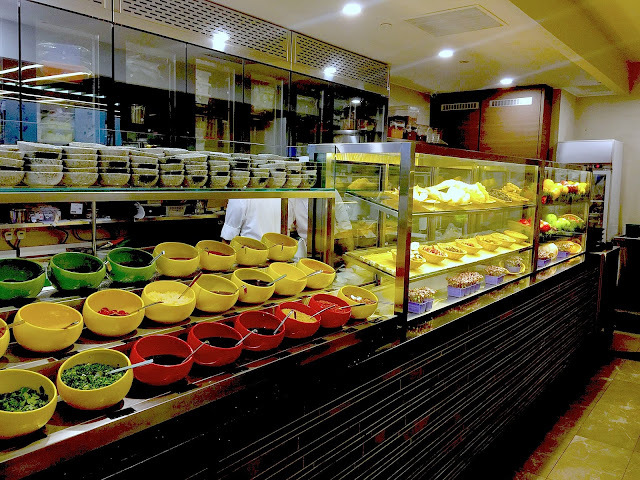 While most, if not all, cantonese restaurants have a corner dedicated to condiments and sauces, Hua Ting Steamboat has the widest selection of items. While waiting, my friends and I had a lot of fun coming up with different mixes. It'd be great if each condiment was appropriately named in mandarin and english so that customers, especially tourists, would know what they're selecting from. My favourite mix was sesame, peanut sauce, garlic and onions. Lots of soup broths to choose from! Their flavourful soup broths are prepared daily. The Sichuan Mala Seaweed Soup is not overwhelmingly spicy such that you can't even drink the soup. However, like all mala soup, it does have a spicy burn that lingers on your tongue. My favourite is to dip the already cooked food into this soup broth as a flavour enhancer. Personally I prefer the Shark Bone's cartilage soup— which boasts full of collagen. With a light milky and mildly sweet savoury flavour, the soup was addictive and we had several refills of it. My friends at the other table ordered this— which was a stunning display of winter melon that was well chopped. This soup contains cabbage, winter melon, wolf berries and dried scallops. The soup gradually turns sweeter as the soup boils— making it absolutely delicious. This is the restaurant's signature as the chef was inspired by double-boiled techniques for soups. Cooking techniques differ here too— the center of the winter melon is meant for cooking thin strips of meat (i.e. think shabu shabby while the outer circumference is for larger items that require infusion. Prawns are immediately caught from the tank for each order— and they make it easy by inserting them on a stick. It's as simple as leaving your prawns in the steamboat and lifting them out after it's cooked bright orange! Quite fresh! The $12 option gives you 8 slices of fresh kurobuta pork. There is also the Fresh Kurobuta Pork Belly (S$7 or $14). These were gone in a flash. Very yummy! Cook scallops until they're opaque— otherwise they get very tough to eat. The scallops were sweet and tasty, I'd order it again! They had a good source of supply for mushrooms— extremely fresh and tasty. You can see that there isn't any single mushroom that was rotting or blackened. Love this! I don't fancy potato chips but I absolutely love, love, love these satisfyingly crunchy fish skin! It was addictive. I'd order them again. Unfortunately, the meat within each dumpling escaped in the boiler. The skin wasn't as tender or thin as I'd expect. What is steamboat without enoki mushrooms? Also known as golden needle mushrooms, their firm stems and white buttons give a hearty flavour to the soup. Add a little soy sauce and you're good! "Can we have more luncheon meat?" Believe it or not, we ordered three plates of these because they were so good. It did not taste like those that comes out from the can — they were freshly homemade and are in a league on its own. Addictive— I'll order more of these again! Very fresh, these fresh shrimp paste balls have a great texture. I wish they were bigger though, because it was still pretty tiny when cooked. Excellently fresh and there was more meat in each strip than fat. Overall, quite good. Don't they look like noodles? These has a dotty texture to it, which makes me feel like my tongue was going through an exfoliating session. This is unlike the typical tasteless beancurd skin. Because the skin is soaked and boiled in the broth, this was a lot more delicious. One of my favourite balls— well-balanced, handmade and really fresh. Great taste! My brave friends tried some innards such as the chicken liver, intestine, etc.— which I, in no way, will ever try this. Thus I won't be able to comment on the flavours for this. Three pots of tea for the 10 of us! The fish maw soaked up every delicious juice possible from the broth— I'd say it taste a lot better with the shark cartilage broth. Otherwise, soaking in the spicy mala broth will be too spicy! We ended our dinner with a huge platter of cut fruits— it must have taken quite a lot of effort to ensure that each piece is somewhat similar in size. I like how the chefs in there restaurant pay a lot of attention to details like these— from the way the food is served to the type of plate/bowl they use. I really enjoyed myself a lot at Hua Ting and I hope to recommend this place to all my friends and family who are looking for a nice, quiet steamboat restaurant to visit!